Wildlife enthusiasts and nature lovers will appreciate this scenic wonderland that offers a variety of outdoor experiences for all ages to enjoy. 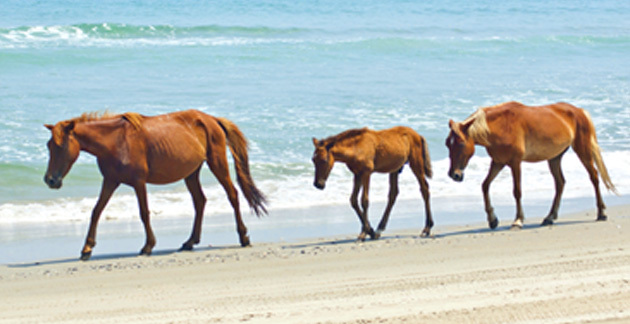 See the island's famed wild ponies. Visit the historic 1833 lighthouse. Explore quiet coves and inland waterways on a kayak tour. Or enjoy a sunset cruise along the isalnd shores. Single day vehicle passes range from $3-$10. No fee for bicycles and pedestrians. Open from 6am-6pm, November-March; 5am-10pm, May-September; 6am-8pm, April & October. In addition to the island's famed wild ponies, you'll see animals like bald eagles, red fox, Atlantic bottle nose dolphin, horseshoe crabs, peregrine falcon, snow geese, silka deer, and much more. Yes, tent, trailer and RV camping is allowed year 'round at over 300 campsites. Picnic tables and fire grills are available, but RV hookups are not. Camping fees are $16-$30 per night. Reservations are recommended.